The presentation of Book 2 of 'Biliki' series took place on March 26 at the Courtyard Marriott Hotel in Tbilisi. The book was recently published with financial support of US Embassy in Georgia. Foreign envoys, who have successfully completed Book 1 and are now studying Georgian with Book 2, gave speeches in Georgian language during the presentation. Turning up in the status of students, they spoke about their accomplishments before invited guests and related how they managed to reach the results of communicating in Georgian effectively and with confidence in a short span of time. 'Biliki' series consists of 4 books designed by Nana Shavtvaladze, Director of Language School (LS). This series offers Georgian language lessons on 3 different levels: Survival Georgian, Conversational Georgian and Full Course of Georgian Language. Book 1 of 'Biliki' was released two years ago. Language School was established in 2005. It represents an official contractor of UK and US Embassies in Georgia. The organization offers classes in Georgian, Russian and English languages for expatriates through up-to-date methods of teaching and authentic audio-visual material. Students are mostly diplomats accredited in Georgia and representatives of various international organizations. These include staff members of British Embassy, US Embassy, United States Agency for International Development (USAID), European Union, Peace Corps, Organization for Security and Cooperation in Europe (OSCE) as well as students, who are staying in Georgia on exchange programs. Book 2 of 'Biliki' consists of 16 units. Each unit has a text, new words, exercises and a dialog. A test follows each 4 units. Appendix provides key to tests, grammar in tables, verbs and their conjugation forms and a 100-word glossary. Book 2 has a CD with 50 dialogs recorded by Georgian actors. Shavtvaladze holds PhD in linguistics at Tbilisi State University (TSU). 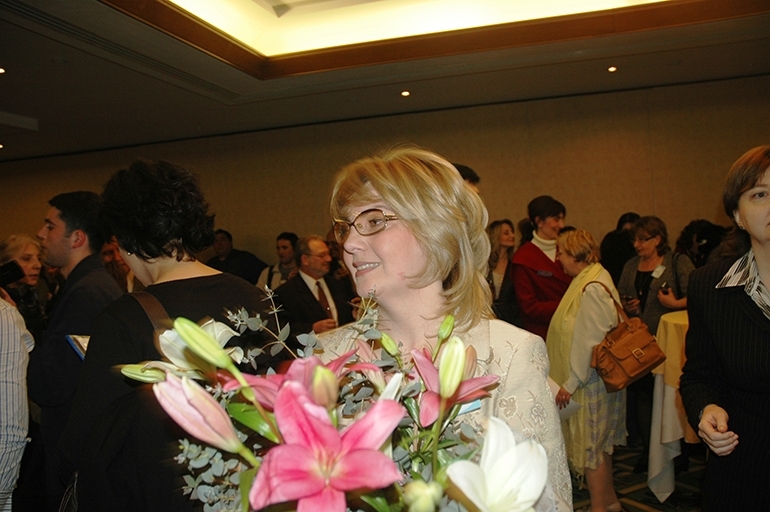 She has a 10-year experience of teaching Georgian and has authored more than 20 academic articles. Shavtvaladze continues working on textbooks for foreigners. The 3rd and 4th parts of 'Biliki' will be coming out soon. 'The main goal of Language School is to teach its students to use the language as a communications tool. We practice a fully communicative technique of teaching; an approach that is continuously being updated. The focus is placed on active application of language rather than passive reception,' Shavtvaladze said. John Hansen, USAID Energy and Environment Office Director said that he had been studying Georgian for three years and many Georgians were surprised by his progress. Oliver Reisner, Project Manager of the European Commission's delegation to Georgia said foreigners usually faced a problem of where and how to study Georgian language. 'Georgian language is a key component of the Georgian culture. However, Georgian language is difficult and not every foreigner is able to study it,' he stated, but claimed that he found a solution at Language School where studying turned out to be fun and beneficial alike. Keefe, who spoke some Georgian before his arrival to Georgia, is now on the second level at Language School. He already feels comfortable in Georgian speaking environment. He said good command of the language was very important in diplomatic relations. 'I often speak Georgian when meeting with Georgian colleagues and governmental officials. Speaking common language is the best way to interact with people,' Keefe claimed. The British Ambassador found it hard to answer the question of Georgian Journal why it was difficult for representatives of Georgian opposition and governments to find 'common language' when all of them speak Georgian. 'It is essential in any country for the opposition and government to find common language. I know there are politicians on both sides who are trying to do that. I would encourage them to continue with their efforts,' Keefe said.